No matter how many Leicas one buys and sells in their career, there are always those special ones that resonate a special sentimentality in us. The camera that we took our favorite photo with, or the one that belonged to your grandfather, or perhaps the one with serial numbers with last digits that match your birthday. Often when this favorite camera is found, it becomes almost painful to use it unprotected as with each scratch the camera dies a small death. We fantasize that this machine can out live us, and perhaps our progeny too, like a miniature piece of immortality. Artisan & Artist* is one of the few companies to address this problem with their new Leather Half Case. Fashioned like a thinner bottom half of the ever ready case, this case covers many of the most vulnerable parts of the camera without adding significantly to the bulk or weight in the process. 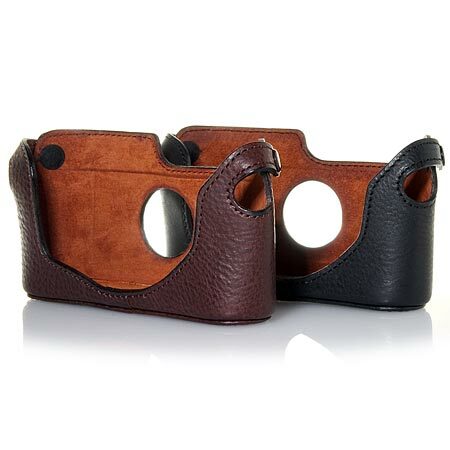 Made out of soft lamb skin type leather, it delicately cushions the camera inside with suede. However, it does this while stretching ever-so-slightly to fit the camera like a glove and protect it from any harm a miscellaneous zipper or table edge might seek to inflict.